Graduating college and getting a job. For most of us, it’s an inevitable rite of passage. It’s a fun time, an exciting time; but more than anything, it’s a period of transition. You might find yourself working in the city, adapting to the rigors and routines of a 9 to 5 job and the responsibilities of forging through life on your own. You’ve got new friends, coworkers, and a wealth of opportunities ahead. You’ve also got a city’s worth of exciting bars to explore. The thing is, just because you swapped your faded jeans and t-shirt for some more professional-looking duds doesn’t mean you’ve fully adopted new drinking habits. You’ve only recently emerged from a world of Rolling Rock, keg stands, and Jello shots. A cocktail to you is rum and Coke, with a lime on special occasions. You might even think white zinfandel is a drinkable wine. So yes, you might look the part of a young business professional, but when you’re meeting friends after work, places like TRADE or Scholars aren’t quite your scene just yet. Plus, you don’t have mom and dad to bail you out anymore when funds are low. Welcome to Sidebar. A Boston dive bar that straddles the border of the downtown area and the Financial District, Sidebar also sits at the junction between your college mindset and your evolving identity as a responsible, gainfully employed adult. 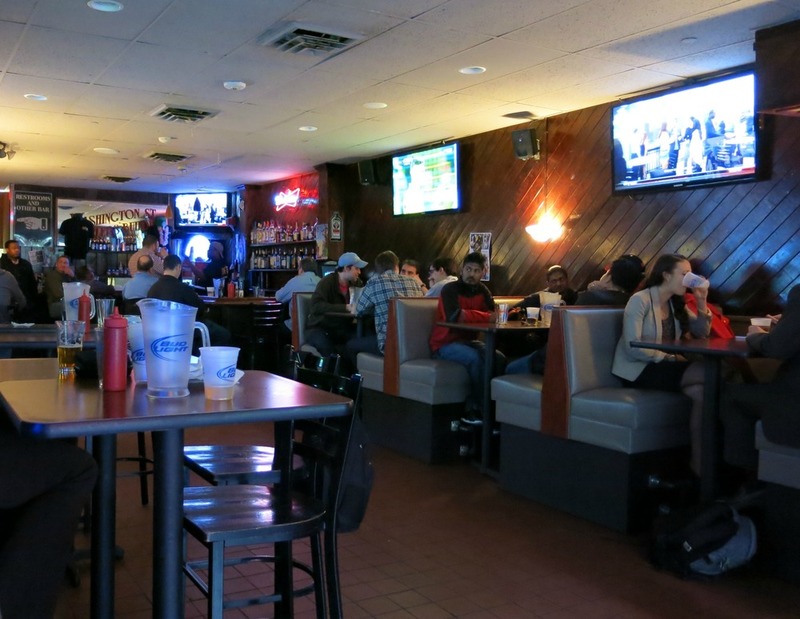 It has all the trappings of the typical city dive bar – no-frills attitude and décor, a couple of arcade games, and most importantly, cheap beer – yet its location draws a hearty after-work crowd from the countless businesses in the area. So when the clock strikes 5, you tend to see a lot of people with their suit coat in one hand and a $2 Bud Light in the other. Sidebar has two separate rooms, each with a markedly different feel, but united by the rust-colored tile floor that seems to come standard in a Boston dive bar. One side is your standard, straightforward barroom – a long, 20-seat bar in a narrow, dimly lit room, with about five tables and a couple of booths. Some of the walls have exposed brick, others are coated with fading blue paint and years’ worth of scuff marks. Neon signs, Guinness mirrors, and posters provide a little ambience. The other side reminds me of an on-campus college bar or the common room of a frat house. It’s a big, open room with wood-paneled walls, maybe 10 tables and booths, and a small bar. Video games like Big Buck Safari and Golden Tee, along with a booming jukebox, tend to make this the more boisterous of the two sides. Sidebar’s always been an occasional destination for me. The location can’t be beat; it’s close to my office and on the way to the T, so it’s a trusty spot for an after-work beverage. I stopped in a few weeks back to meet my friend John, of Brew Dudes fame. 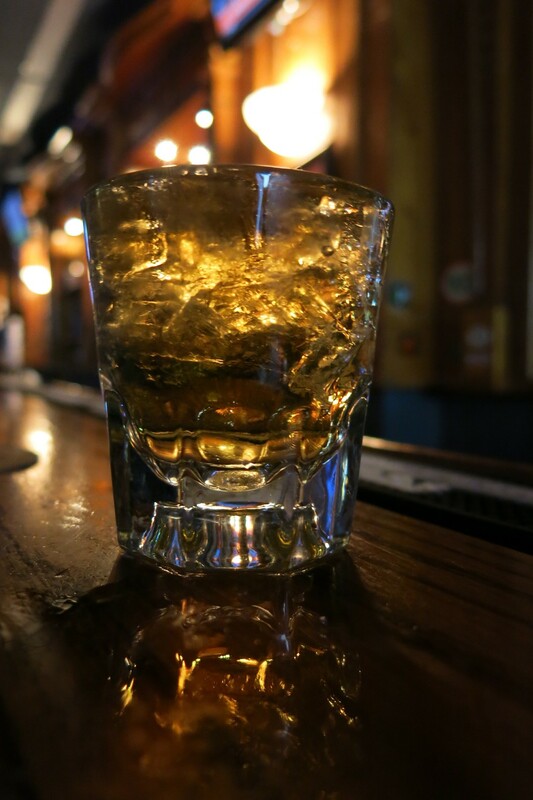 I took a seat on the quieter of the two sides and enjoyed a Jameson on the rocks while I waited for him, watching as the bar almost completely filled up by 5:15. When John arrived, we grabbed a wobbly table and began discussing beer options. 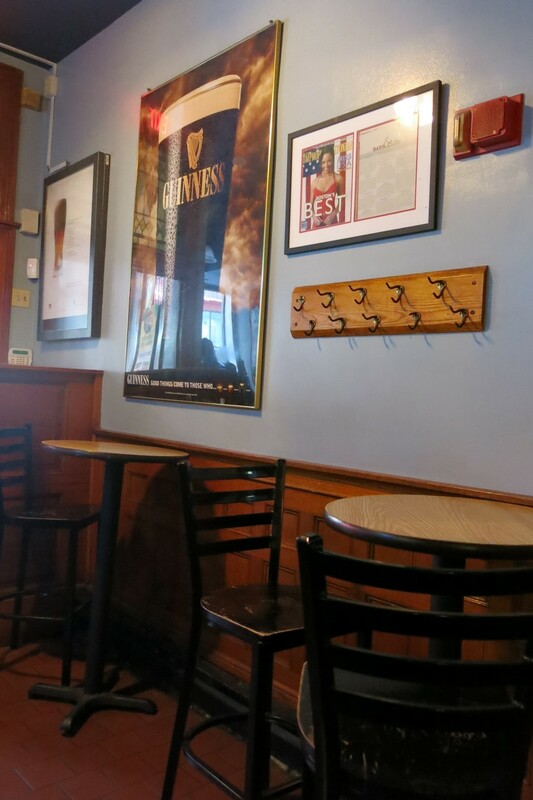 Sidebar’s draft selection is pretty average – Sam Adams, Blue Moon, Guinness, Red Hook, that sort of thing. But it’s the $7 pitchers of Bud Light that have helped this place build such a devoted following. 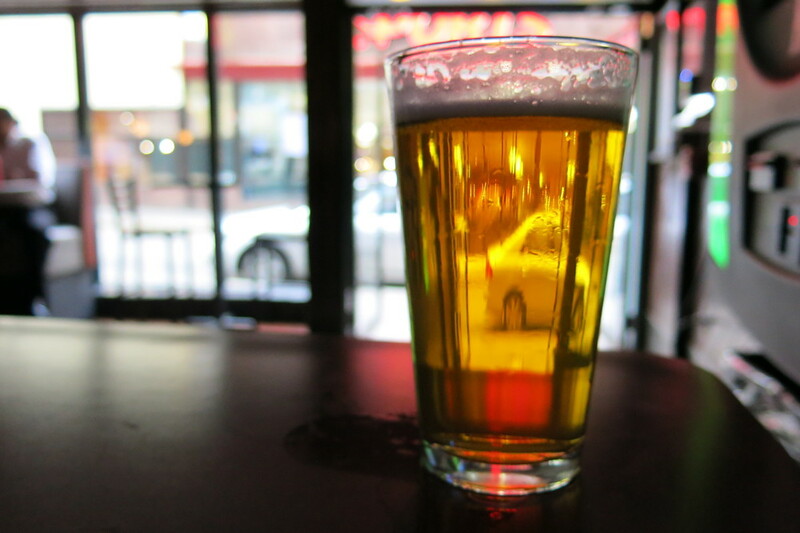 There are bars nearby where you can spend $7 for a single beer, let alone a pitcher. I would have gotten one – it’s sort of obligatory here – but John is an aficionado of microbrews and a producer of excellent homebrew; I couldn’t in good conscience ask him to go for BL. We went with Sam Adams Alpine Spring instead. That led to a lengthy discussion about how disappointed we were that Sam Adams began selling their “spring” beer in January. Last I checked, January is the dead of winter. It’s bad enough that stores put up Christmas displays in September; must we rush everything? Couldn’t we have enjoyed some strong winter ale during the winter? Adding insult to injury, Boston Beer Company founder Jim Koch, in response to widespread criticism of Sam’s season-skipping, cheerily offered a flaccid defense of the decision by saying that they released the beer early because New Englanders tend to look forward to the end of winter. Huh? Yes, in the winter, most of us do indeed yearn for warmer weather; but drinking a spring beer in January does not cause snow to melt and flowers to bloom. I’d drink Red Stripe year-round if I thought it would result in a Caribbean climate in New England. Sam Summer’s out now; grab yourself a pint before June, when I’m sure they’ll start selling Octoberfest. Anyway, the Alpine Spring was good. The wobbliness of our table put the pitcher at constant risk for spilling in catastrophic fashion, but that just added an element of adventure to the evening. While Sidebar is already somewhat unusual in that it draws such a predominantly white-collar crowd, it further distinguishes itself from some of the area’s other lovable dives by virtue of the fact that it offers food. And the menu is surprisingly extensive, with broad selections of sandwiches, pizzas, wraps, salads, a few house specialties, and more. Maybe that doesn’t sound like anything extraordinary; but at bars like Beacon Hill Pub and Sullivan’s Tap, the only edible goods tend to come from a vending machine. One doesn’t go to a place like this and expect to see a variety of, say, panini sandwiches, but there they are – meatball panini, veggie panini, roast turkey panini, and so on. John opted for the chicken pesto panini, topped with provolone cheese. The list of burgers features an astounding 15 options, with a tempting-sounding teriyaki burger and a deep-fried burger topped with bacon, BBQ sauce, and cheese, which may well have been worth the few months it would take off my life had I ordered it. 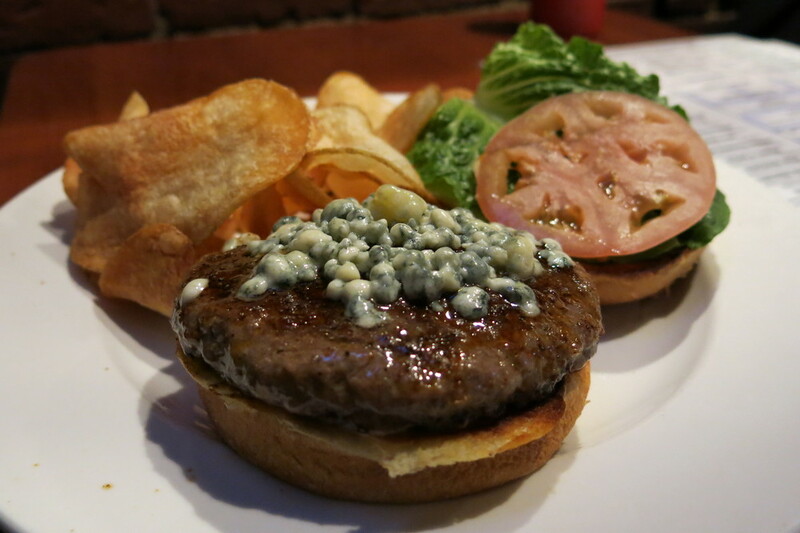 I settled on the blackened bleu burger, coated in Cajun spice and topped with blue cheese. It was a pretty good burger! Nothing outstanding, but definitely satisfying. John and I hung out for a while after dinner. The post-work crowd thinned out after 7 or so, making it a pretty mellow environment for killing time, chewing the fat, and watching whatever games were on one of the five TVs. We discussed the Sox, the merits and drawbacks of Led Zeppelin’s “Presence” album, and the emergence of excellent craft hard ciders, like those made by Downeast and Bantam. Since we were on the subject, I got an Angry Orchard to close out the night. I would call it more of a hard apple juice. The fact that you can see right through it in this picture might tell you something. 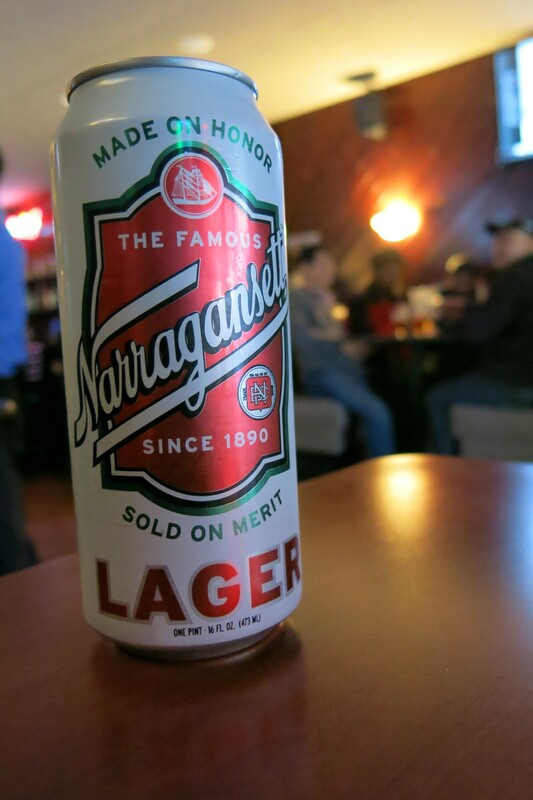 Since no review of Sidebar would be complete without a trip to its other side, I returned a week or so later and settled in with a Narragansett. If the more conventional side of Sidebar is where you meet a friend for a drink, the second side is where you head with a group. Whenever I walk into this half of the Sidebar, I feel like I’m arriving at a party that’s been going on for about 9 hours. 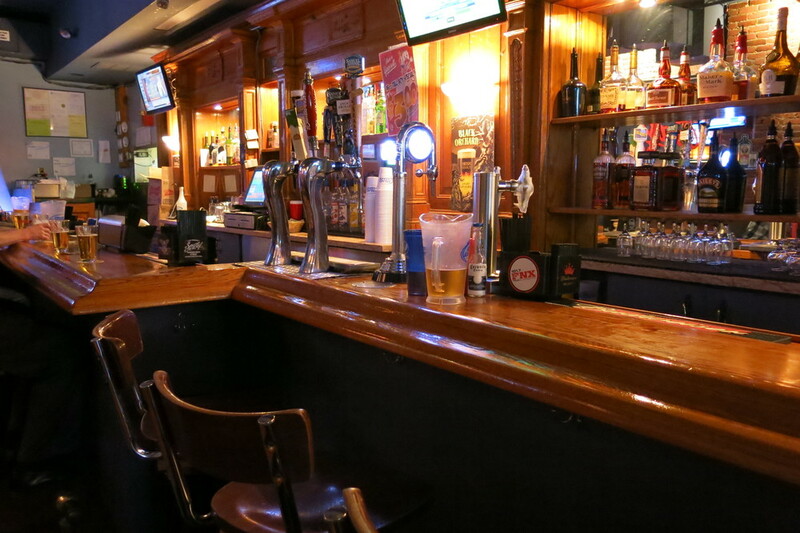 There are tables with empty or half-filled beer pitchers, a few guys taking down some wild game on Big Buck Safari, sports on all six of the TVs, and something always blaring out of the jukebox. 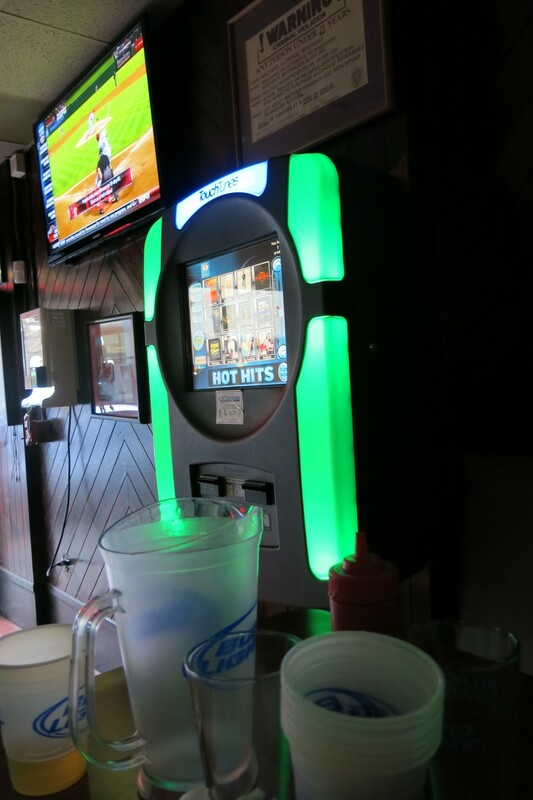 When I was there last, there was music coming from the jukebox and the bar at the same time. Nobody seemed to notice. This side of Sidebar might be louder and have more of a late-night party feel, but it has the same casual, come-as-you-are atmosphere as the quieter side. It recalls visions of crowding around a table with good friends and bad beer, laughing the night away. Maybe that’s a chapter of your life that closed long ago. But I think it’s the kind of thing you never get too old for. It might be as laid-back a bar as there is in Boston, and that’s a good thing. Sidebar is right smack dab in the middle of one of the busiest sections of the city – exactly the kind of area that needs a cozy, comfortable dive bar. And I do this place a disservice if I characterize it solely as a hangout for people in their 20s who haven’t outgrown their college days. Sidebar draws a diverse clientele, from professionals to Suffolk Law students to anyone who enjoys the merits of affordable food and drink. One gets the sense that all are welcome here. 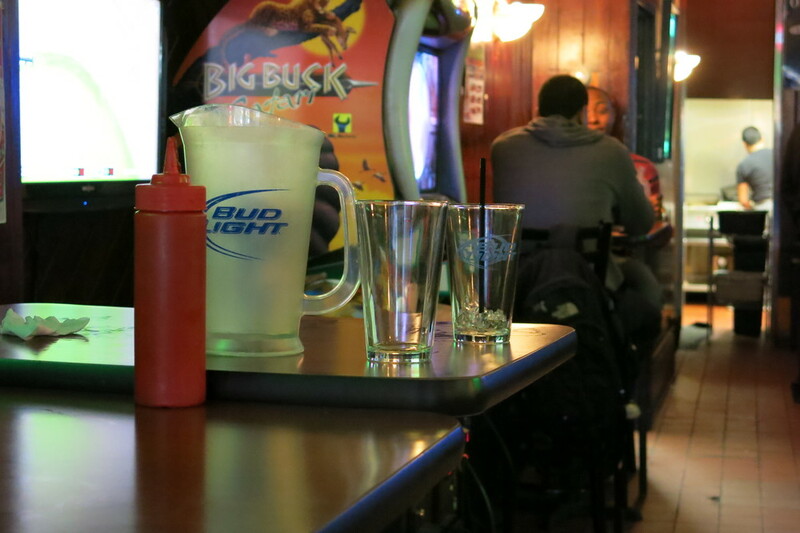 The $7 Bud Light pitchers are the best value, but not the only good deal. If you don’t need a pitcher, a Bud Light draft will run you $2. My Narragansett was $3. Prices for other beers and drinks are fairly standard. Our pitcher of Sam Adams “winter is coming” Alpine Spring was $18, and my Jameson was $6. Other draft beers are about $5, which is pretty good. The food is reasonably priced, though it’s higher than what is currently displayed on Sidebar’s website. John’s panini and my burger were each just under $10. Not exactly a steal, but since sandwiches and burgers in the area are starting to average around $12 (which blows), it’s still one of the better deals around. If you’re looking for eclectic beer selections and craft cocktails, there is no shortage of bars serving them downtown and near the Financial District. 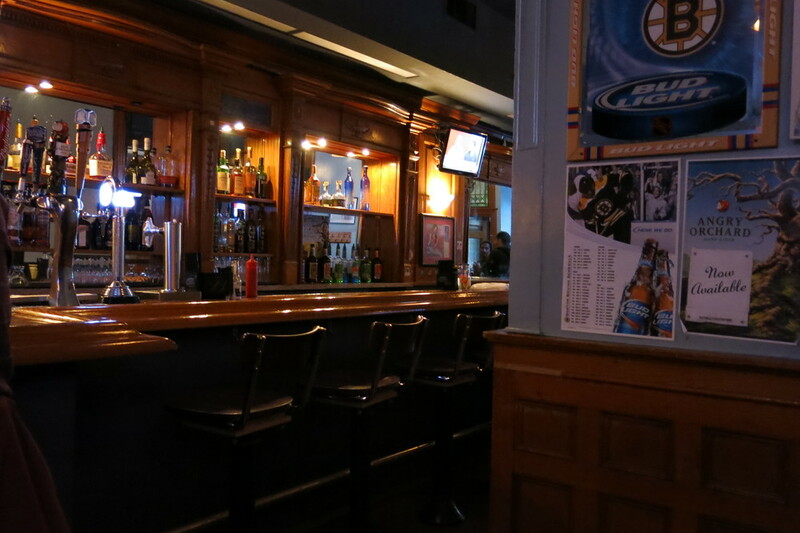 The area is home to some of Boston’s most popular bars, like Stoddard’sand JM Curley. Sidebar, meanwhile, is comparatively modest; it almost blends into the other storefronts along Bromfield Street. It’s a low-cost alternative that isn’t as shiny and trendy as some of its neighbors, but there’s much to be said for pitchers of beer and a good jukebox. Because while the popularity of microbrews and artisanal drinks will ebb and flow, the simplicity of a comfortable bar with cheap beer will never go out of fashion.